Anybody know if there's a number you can phone to speak to someone at BT about a fault on the line? I have reported the problem online a few days ago but heard NOTHING!! 151 from a BT line, whats the problem? What are the ways to report a fault? I've just got no dial tone so cant use bt line, will have to be mobile. Looked at everything else and cant see any probs so presume it's the line. Thanks for your help guys, Rep'd. Anybody had any problems like this before? Just wondering how long im gonna have to wait? I've just got no dial tone so cant use bt line, will have to be … I've just got no dial tone so cant use bt line, will have to be mobile.Looked at everything else and cant see any probs so presume it's the line.I guess i'll use that 800 800 151 number but im guessing its gonna cost a fortune :(Thanks for your help guys, Rep'd.Anybody had any problems like this before?Just wondering how long im gonna have to wait? Have you tried ringing 151 from the phone? No but as theres nothing there just silence, i presume it wouldn't work? You work for BT lol. just rang the 800 800 number and it gave me another number that said is at normal rate and will come out of my inclusive minutes. Just got through and apparently there IS a fault on the line. Another bit of info though .... if you ask them to come and sort out a fault and they then find it's a problem within the house like an extension lead or the phone itself, they now charge you for the callout :? Have you eliminated your internal wiring/apparatus? Well he said it's showing up as a fault and because my internets down too, it must be a fault, most likely outside the building. Well he said it's showing up as a fault and because my internets down … Well he said it's showing up as a fault and because my internets down too, it must be a fault, most likely outside the building. Don't take the chance for the sake of 2 minutes work. 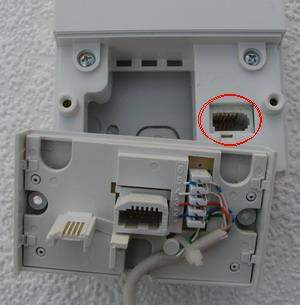 Remove the 2 screws in the front of your master socket, detach the removeable face plate and try a phone (nothing else) into the socket circled. Did they divert your calls to a mobile? If the engineer comes in your house and proves the fault internally (by doing what I have explained) you will get charged. Ok will try and give it a go when i get home tonight. Any idea how much the charge would be? Ok will try and give it a go when i get home tonight.They sent me this … Ok will try and give it a go when i get home tonight.They sent me this vid clip http://www.youtube.com/watch?v=NGtz-GCi7ywAny idea how much the charge would be? Despite doing a 14 hour day and having to go to bed as soon as i got in from work late last night, your words of the £100 were ringing through my mind lol. I hunted high and low for the right screwdriver and undid the screws and tried the phone in the socket on the right. Still got no dial tone so just hope i did it right as i was tired cos cant afford a £100 hit 2 weeks before crimbo!! Yep, received call yesterday morning from engineer saying he need access to the property (which wasn't gonna happen as i was miles away in buckinghamshire ta work). He said he found a fault outside but couldnt test the phone as he was getting no signal. Got home late last night and it worked. BT even rang me a couple of times to check if it was fixed as the engineer had told them it was. All in all pretty happy with BT and their customer service.